Sited just over five minutes from the city centre, Dubai International Airport (DXB) is close to the Muhaisnah area and Mushrif Park. 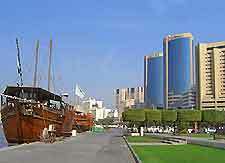 The terminal can be reached off the Airport Road, which runs in a south-east direction from the city centre, on the eastern side of Dubai Creek. Dubai Airport is also near to the D-60, which runs along the eastern side, parallel to the Emirates Road. The D-95 lies to the north and passes the Al Qusais Industrial Complex. Further north you will find the Sharjah Ring Road. The roads accessing the Dubai International Airport complex experience traffic delays during morning and evening rush hours, as well as on popular holidays. Please be sure to leave well before your check-in time when you are driving to the DXB Airport during peak times.